Yesterday the entire footage of what appears to be a UFO docked at the International Space State (ISS) was released and uploaded to Youtube. The video shows the sleek looking yellow UFO docked at the ISS for just over two minutes with the Earth slowly rotating in the background. The video ends with ISS live feed going into blue screen mode. This likely indicates that NASA cut the ISS live feed once it was realized that the video of the UFO docked at the ISS was going live to the world. The docking positioning of the UFO suggests that it is not the result of a camera anomaly but a genuine spacecraft of unknown origin. The incident happened on January 29, 2014 and was transmitted by NASA’s live camera feed of the ISS which is made freely available on the internet to the general public on Ustream. The live camera feed was recorded and part of it was initially uploaded to Youtube by the user Streetcap1 on January 29. After requests by users to see the full camera feed, Streetcap1 uploaded all that was recorded yesterday, February 5. The full video shows that the UFO was stationary and appeared to be docked with the ISS. The UFO is seen clearly in relation to the ISS thereby allowing for an accurate estimate of its size. One estimate was 10 meters in length. While the earth slowly rotates, the UFO remains stationary suggesting it is not a lensflare, glare, reflected image or other kind of camera anomaly. 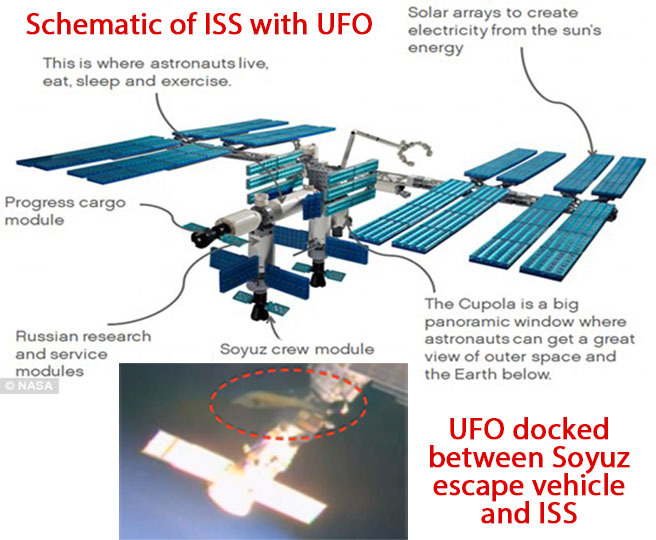 A schematic of the ISS (see above) shows the UFO was docked between the Soyuz escape module and the Russian research and service module. If a UFO was to dock with the ISS, this would be one of the five active docking locations where it could so in order for personnel to be transferred on to the ISS. The location of the docking is very suggestive. 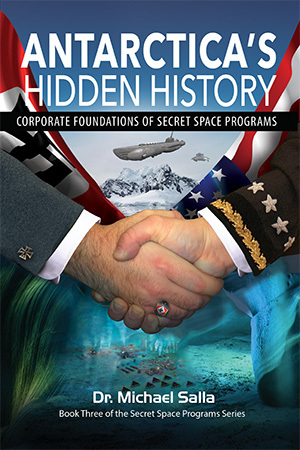 Was this a veiled warning by the UFO’s occupants involving the lives of the ISS astronauts? Was there some kind of communication between the ISS and the UFO’s occupants? If the UFO had occupants, did they actually enter the ISS? Finally, why the blue screen at the end of the live video feed, was this done by NASA to cover up what was happening at the ISS which was possibly an unannounced visit? NASA has a lot of questions to answer. Is a UFO monitoring astronauts during ISS space walk? Is a giant cigar UFO hovering near the International Space Station? 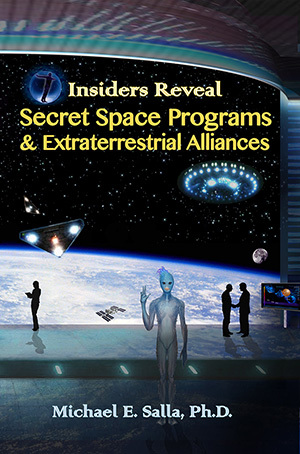 ← Did a UFO dock with International Space Station for alien astronaut meeting?